Hand embroidery has always been Sabrina Marton’s favorite needlework technique. But some years ago she decided to make t-shirt quilts for her sons. While thinking about which t-shirts she would use, she stopped to take a quilting class with C. J. Spensley and found herself suddenly launched into an unexpected world of artistry. Excited about this new experience, she searched the internet for a local quilt group to join. She found Riverwalk Quilters Guild and, as she recalls, was warmly welcomed. Born and raised in Chicago, she travels frequently through much of the United States and now looks for quilting ideas wherever she goes and is amazed at how much she learns from each new project. She belongs to the Ladies of the Lakes guild in Florida where her RQG Naper Settlement challenge entry won a “Judge’s Choice” award this year. Her exquisite cross-stripped heron won a first place award from the same group. 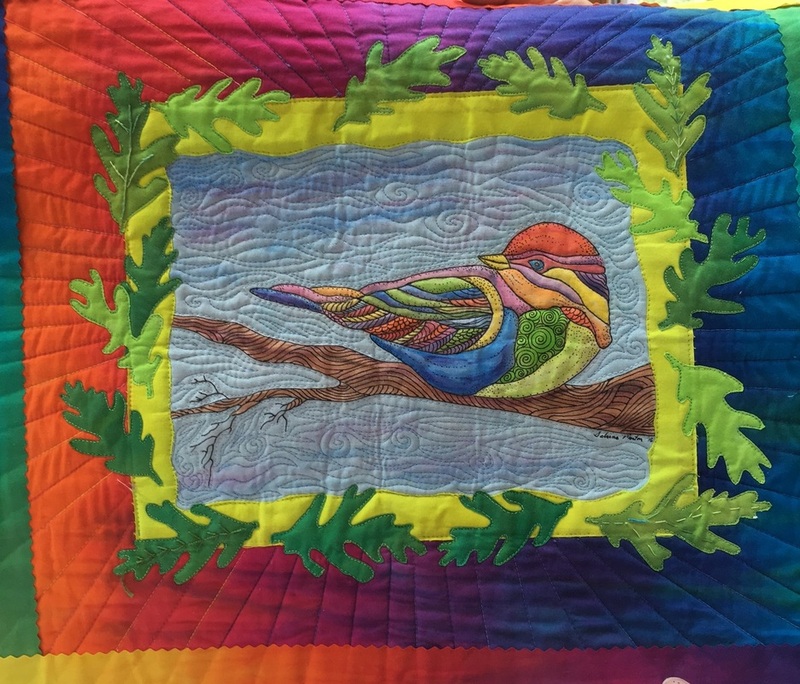 Recently she took a workshop with Victoria Findley Wolfe of “Double Wedding Ring Quilt” fame and learned to connect Y-seams in a colorful design. Her home sparkles with the results of her creativity. Sabrina has contributed much to the guild through her work with Contracts and as Newsletter Editor. One of her greatest contributions was helping to guide her son in creating the new RQG website which can be easily maintained by members. 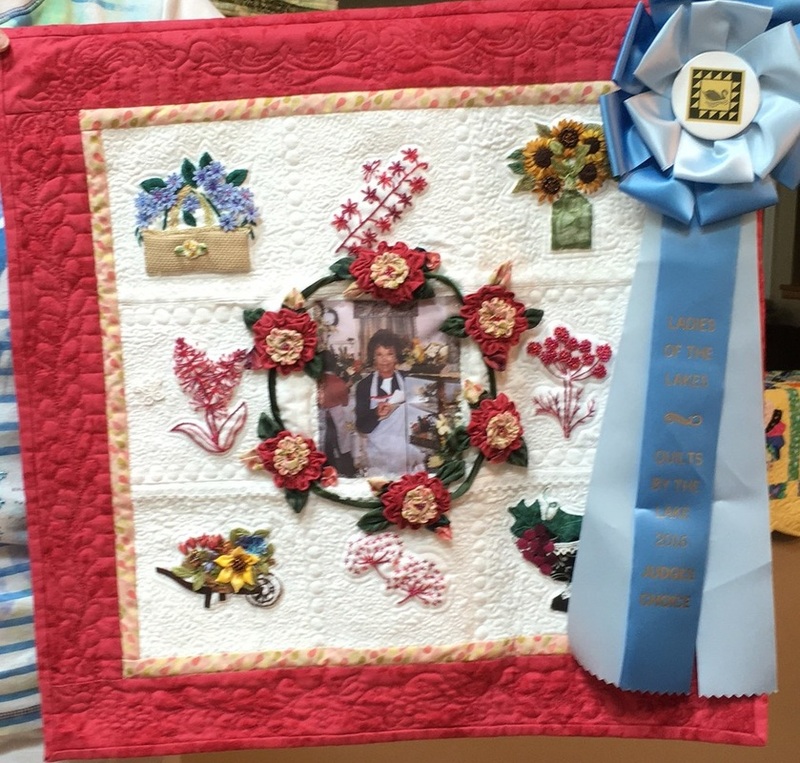 She also devoted herself to making sure the recent guild raffle quilt traveled as much as possible to publicize the hard work of RQG’s many quilters. She is a member of Prairie Hearts Bee. She did end up making t-shirt quilts for two of her three boys when they went to college and made a Blue Underground pattern for her youngest son. She still has lots of t-shirts to make into quilts but has enjoyed moving on with new techniques.